Treating wounds, especially complex and chronic ones, requires expert care and knowledge. Failure to properly treat an open wound can lead to life-threatening emergencies such as sepsis and hospitalization. 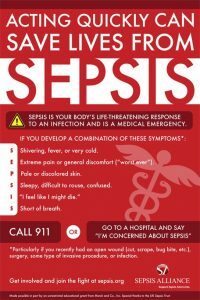 Sepsis, commonly called blood poisoning, is an infection that gets out of hand and spreads rapidly throughout the body. Sepsis can come on very suddenly, without any warning and must be treated with antibiotics as soon as possible. If not treated in time, sepsis can lead to organ failure and death. Neuropathic ulcers are mainly found in diabetics. Peripheral neuropathy dulls and numbs pain in diabetics, so they often overlook a wound, as they cannot feel the pain. Even a tiny scratch that is not properly treated can become a festering wound. Sometimes it is only noticed after there is fever, swelling and a pus filled wound. Schemic ulcers from arterial insufficiency are commonly found in diabetics. Schemic wounds are often a result of peripheral artery disease (PAD) which reduces blood flow to the lower legs and prevents wounds from healing. Chronic wounds like pressure ulcers, venous ulcers or diabetic neuropathic ulcers are all ulcers that do not respond to normal treatment and do not close and heal during a 30-day period. These are infections that take place in surgical incisions after an operation. Park Crescent has advanced equipment like the hyperbaric oxygen extremity chamber. Hyperbaric oxygen therapy (HBOT) leads to wound healing by stimulating circulation and boosting the formation and growth of new healthy tissue. The sealed humidification system also helps in speeding up the healing process. Electric stimulation or E-stim provides an electrical flow through the tissues which stimulates healing in chronic wounds. The KCI Wound Vac speeds up the healing process and reduces the risk for infections and complications. Park Crescent also offers expert diabetes care and monitoring. This is crucial, as many complex wound care conditions affect diabetics. Park Crescent also offers a fantastic array of recreational activities for the residents. These promote socialization and a feeling of well-being among the residents. They also have fine restaurant dining that offers healthy, nutritious and delicious cuisine. Wounds must be properly cared for, especially in diabetics. Wounds that get out of hand may be treated in facilities that offer complex wound care therapy like the Park Crescent Healthcare and Rehabilitation Center in East Orange, New Jersey.